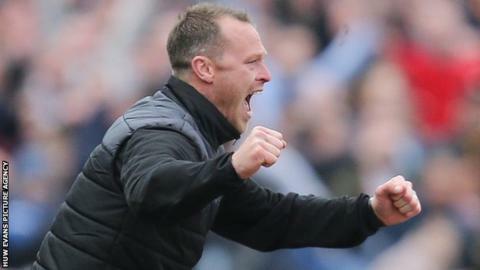 Newport County have confirmed Mike Flynn as their manager on a permanent basis. Flynn, 36, has been rewarded with a two-year deal after securing League Two survival in a 12-game caretaker spell. Coach Wayne Hatswell and advisor Lennie Lawrence will also remain at County, who avoided relegation with victory over Notts County. "Nothing makes me prouder than to take charge of my hometown club," Flynn said. The appointment means midfielder Flynn has all but hung up his boots as a professional player, despite five League Two appearances this season. Though he may register as a player, he said: "It will just be an emergency if anything happens, you can take it I am retiring because unless we have a horrendous run of injuries then I won't be doing anything. "Its a new chapter in Michael Flynn's career and its management not football." Flynn will immediately set to work on reducing the size of County's squad, while seeking to keep key players who engineered the astonishing late revival. The former Wigan Athletic and Gillingham player is anxious to take that momentum into next season, but warned: " I am not going to say I am a miracle worker and we are going to win the league by ten points. I am honest it's going to be a tough job but it's an exciting job. "We have to get the recruitment right. We need payers in who will take us up the league. We are already having a chat about targets and what we think we need. "For me there was not enough pace in the team so we need to increase the pace around the pitch." Vastly experienced Lawrence said Flynn's knowledge of the club - he made more than 100 appearances for County - was a key to survival and would be important going forward. The former Cardiff City, Charlton and Middlesbrough manager said: "If you are at a club like Newport it has to be more than a job. It's a young man's game unless your are at the top. You have to have a good work ethic. "The fact that he's local, started and finished his career here, is a big advantage. He knows the club he knew the players. Now he has to show skills in a recruitment department." Meanwhile the club have released Liam Angel, Marcus Beauchamp, Paul Bignot, Jack Compton, Tom Meechan, Kieran Parselle, Finlay Wood following the end of the season. Darren Jones, who has had two spells with the club, also announced his retirement. Read more on Newport County: What next for Exiles after their greatest escape?